Last night there was a Tweetup — the first I’d actually attended in LA (I know, I’ve been a bit of a slacker since getting back into town what feels like a very short 6 months ago). In any case, when I heard that people were getting together nearby after attending Gravity Summit, I thought I should stop by to meet some new people. The Tweetup was at Palomino in Westwood, a very popular bar and restaurant — I want to go back and try their thin-crust pizza because it looked delicious. The place was packed with a lively post-work/post-conference crowd, and I meandered around a bit before Rodney Rumford saw me looking a little lost and made some introductions (thank you!). There was quite a big crowd, so I didn’t even come close to meeting everyone, but I did have some nice conversations with Ben, Dustin, Tony, Ricardo, Alan, Angie and John. I also ran into Jon Rognerud, who I worked with when I was an editor at Entrepreneur.com — we’d never met in person, so I didn’t even realize who he was at first! It was great to get out and meet some new and interesting people. And tomorrow I have another event — the first ever Tuttle LA. If you’re available tomorrow morning and can make it to Long Beach, I’d love to see you there. This morning, Evan and I wanted some pancakes for breakfast, but we realized we didn’t have any milk. I wasn’t sure if water would be a good replacement, since most of the pancake recipes I saw that used water also used baking powder, which we don’t have right now. I searched a bit more online but got frustrated by the many variations which didn’t quite work with what I had in my kitchen. 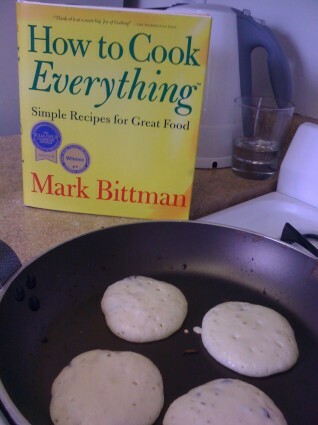 Then turned to my trusty “How to Cook Everything” by Mark Bittman, which I always use for crepe recipes. It has a great section on pancakes, and one recipe is a cottage cheese and sour cream pancake recipe, which sounded intriguing. It also says plain yogurt is a fine replacement for sour cream. I still wasn’t sure what I had would work since I had to modify the recipe, using vanilla yogurt instead of plain, and no cottage cheese, but the pancakes turned out marvelously well — sweet and fluffy and wonderfully light. We didn’t even need any syrup or butter to top them off. Mix together the yogurt, water and egg yolks, then add in the flour, baking soda and sugar. Whisk the egg whites until they form peaks, then fold them into the batter very gently, leaving lots of egg white still visible. Heat some butter or oil in a pan or on a skillet, over medium-high heat. Spoon the batter into the pan in heaping tablespoons, making sure to get some of the egg whites in each spoonful. Flip pancakes when they are bubbling on top and browned on the bottom, and brown the other side. Serve immediately. They’re fluffiest when right out of the pan. We tried a few batches with chocolate chips, but liked the plain ones better. 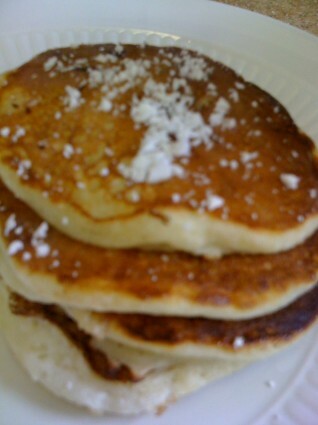 They were really different from the standard egg, flour and milk pancakes, and had a more souffle-like texture. And these pancakes were so decadent, nobody would have ever known they were made with nonfat yogurt. We could have probably even done without the sugar since the yogurt was already sweet. We ate most of them plain or with a little powdered sugar on top. The recipe makes enough for 3-4 people, so we had some leftovers. They’re going pretty fast, though. Maybe we’ll try them again for Pancake Day — it’s this Tuesday! You’ve seen some of the pictures from the rather treacherous drive, but now to talk about the actual weekend. Friday night we got set up in the condo and cooked. I made garlic bread, rancher’s pasta and salad, then we settled in to play a game of Trival Pursuit against Caroline and Paul. Saturday, we didn’t try hard enough to get to the mountain early ad got there in time for long lines at the ticket booth and even longer lines at the lifts. 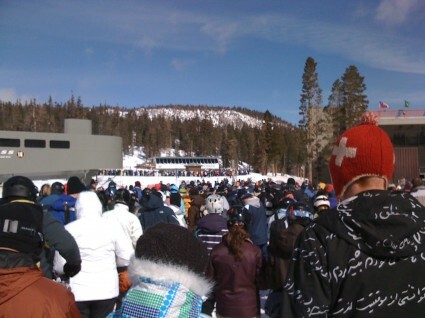 I’d never seen so many people trying to get on at Canyon before. We decided to head over to a quieter part of the mountain, so we ended up over at Chair 25, enjoying the nice, long, powdery runs, and trying to stay somewhat sheltered from the wind. It was sunny, but it was cold and blustery and there were quite a few chairs out of commission because of the weather. That night, our friend Ian came, and we had a dinner of my veggie stew, guacamole and salsa, then played music trivia game Riff (which my parents apparently found at the 99 cent store). Sunday we woke up to even more snow. Thankfully it wasn’t too windy, and it wasn’t much colder than the day before, so we headed out to the mountain. 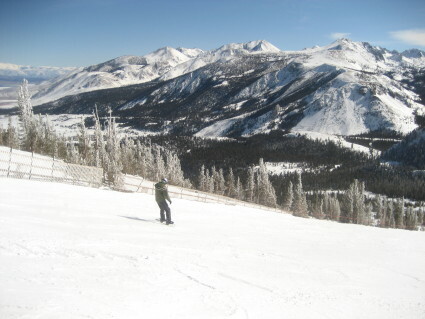 The lines were a little shorter and some more of the lifts were open, including Cloud 9 Express, which goes to some beautiful runs on the far side of the mountain. 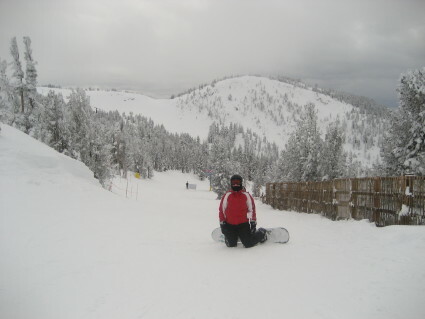 We played in the deep powder and challenging runs on Cloud 9, then headed to the opposite side of the mountain, to chairs 12 and 13, where it was very quiet and peaceful. By the end of the day, the sun had even started to peek out a bit, and we were exhausted from our day. We went out for a nice dinner at Skadi, where apparently the chef is crazy (it says so on the menu!) but the food is very good. Then we went home to make brownies and compete at movie trivia in Scene It? (Go team popcorn!). By Monday morning the snow was coming down pretty hard, so we just packed up and headed home — little did we know how long it would be snowing. You can check out more photos from the weekend in my Facebook album. This past weekend’s trip to Mammoth was incredible. 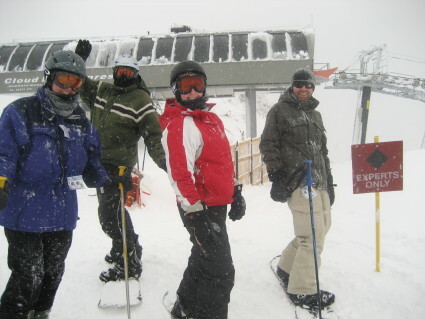 The snow was powdery, we ate lots of good food, and we got to spend some time with friends. The drives up and back, however, were rather trying. 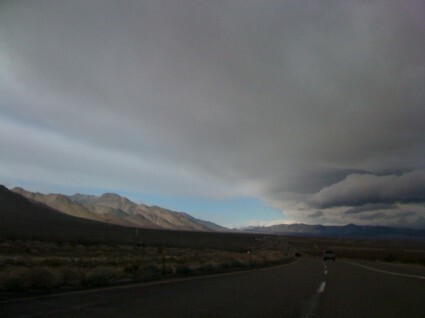 On the way up, we had heavy rain and even some snow in Mojave before the clouds parted to reveal some sunny skies. 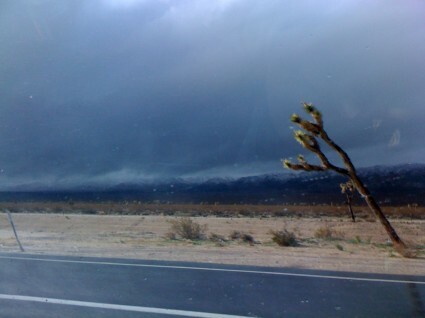 On the way back, it snowed for about three hours of the drive — until we got well below 3,000 feet, then was a mix of wind, rain, a bit of hail, and even an extra dollop of snow in the mountains just outside LA. On the way up, after a few hours of rain, the clouds started to blow over. The strange part was that it happened very quickly, and at this point, the sky was half sun, half seriously ominous clouds. On the way back, it snowed for hours, then rained so hard it felt like we were driving through a car wash. 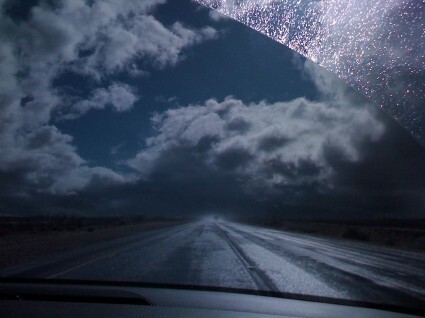 When the clouds finally broke for a bit, the sunshine on the wet road and windshield was very dramatic. I tried to snap some photos of Joshua trees in the snow, since I’d never seem them covered in powder before, but this one turned out to be my favorite. 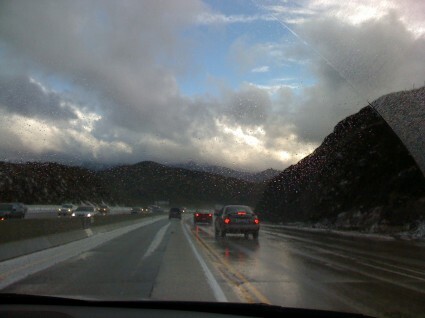 I just had to take a photo of the snow on highway 14, just outside of LA and by Escondido Canyon Road. Thankfully it wasn’t coming down at that point. One of my fondest memories of living in London is my weekly meetups with London’s social media crowd at the Tuttle Club/Social Media Cafe. It’s how I met most of my friends in the city, it inspired me to delve deeper into social media with my work, and it provided lots of opportunities for me to talk about new concepts and learn new skills. When I got back to LA, I really missed the weekly burst of inspiration and camaraderie, which is so necessary when working from home, so I was delighted when Steve Lawson introduced me to Geoff Hickman, and Geoff said he was interested in bringing Tuttle to LA. He’s done some great work already, setting up a meeting place in Long Beach, The Library Coffee House, and we’ve chosen a date and time — February 27 at 10:30 a.m. We’ll be setting up a blog for the group soon, as well. Tuttle Club is a loose group of people who come together to talk and work around social media. It’s freely open to anyone wanting to attend. Sounds vague but it really is what you make of it. Is it a place to meet people interested in social media? Yep. 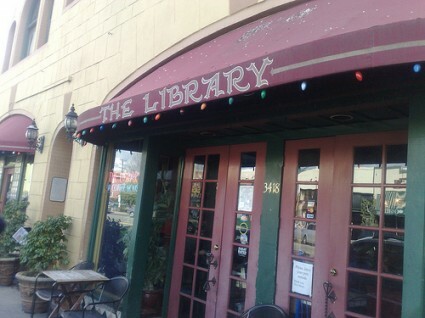 Is it a place to go to get your creative juices flowing? Sure. Is it a place to hatch plans with others? You bet. Is a place to learn, to teach? Absolutely. It’s all these things and more. Of course, this is nothing new. The original Tuttle Club was founded in London by Lloyd Davis and has been a beloved weekly event for many of London’s geeks and creatives for quite some time. It is, however, new to the LA area. That would be Geoff (@geoffsays) and me (@KizzieFK) but to be honest, the Tuttle belongs to everyone attending. A few weeks ago, Evan and I went to the Legacy Effects open house to check out the new location and see Evan’s former Stan Winston co-workers (Legacy Effects is the new name for Stan Winston Studio, the visual effects company that did things like the Jurassic Park dinosaurs and the Terminator). The studio was full of fun things to see, from Terminator models to Edward Scissorhands, to Iron Man. We also got to see where they make the molds — and touch some of the materials they make their creatures out of — and there was footage up of a lot of the testing and filming with the models. There was even a shot of Evan in a pig-lizard suit for Galaxy Quest from his early days at SWS. Apparently he fainted in the parking lot shortly after getting out of the suit since it was so hot and cramped in there. They also had themed drinks, based on the movies they’d done effects for, like the Alien. And there were some characters from commercials, like the Aflac Duck and Death (he was in a Super Bowl commercial this year for something… Pizza Hut? I don’t remember). We weren’t allowed to take pictures ourselves, but they had some photographers walking around, which is where these shots came from.